5/8 Too low for daily driver? I was going to post this in suspension but figured its more of a general question so I chose here instead. The 2/4 was great until the other weekend another single cab with a 4/6 drop on chrome SS wheels parked next to me and made my 2/4 look like a stock height truck ... I was shooting for a 4/7 so it would sit level but my friend kept telling me 5/8 it. First I thought he is crazy, but the more I thought about it how much worse could it be than driving a 4/7? I'm sure by doing this it will actually sit two inces lower rather than 1 like you would think because of the tire downsize, but I've never seen a truck 5/8 in person to know how low it really is. So I figure I would ask for you guys opinion, I've already priced kits out and am ready to make a purchase. I just don't wanna go 4/7 and wish I went lower or go 5/8 and hate life because I scrape going over every bump in the road. I just want to be as low as I can be and still daily drive it, I drive on the highway and out of town some too so keep in mind I may hit some nasty dips going 75 mph lol. Let me know what you guys think! Here's a picture of the guy parked next to me, 4/6 drop on 275/45/20s, I'm 2/4 on 285/50/20. Selling my Arrival Blue 2003 SS Silverado. Truck is in great shape and has been pampered. Low miles, never smoked in, and always adult driven. I am the second owner and it has a clean carfax. It has a matching fiberglass tonneau cover. The car is completely stock other than the radio (original radio to go with it) and the tonneau cover. interior has no rips or tears and outside still looks great. Truck also runs great. New radio has xm and dvd plus steering wheel controls. I just posted it on autotrader and would love feedback from you guys. Let me know what you think. Asking price is $18,500. My email is [email protected] Phone number is 321-246-1985.
i have an 03 SS and wanted to change the sound of it when you start it, all the trucks i've had, i never altered them, i always kept them all stock, but i like the deep rich growl of some modified trucks, i've heard putting a new muffler will change the sound like a flowmaster muffler. but any ideas i don't want it to sound obnoxiously loud, i've also heard the thicker the pipe the louder the sound, any ideas? Hello guys Im new to the forum, and ive seen plenty of older posts for claddings for sale and they all seem to be either too old or already sold. But here is my dilemma i have a single cab SS clone and recently wrapped it around a tree after hydroplaning accross 3 lanes. Im ok and the majority of the truck is too im in the processing of rebuilding the truck but i still need the driver door cladding only! so if someone has one or knows someone who does please let me know, thanks in advance. I have a pair of front brake ducts for sale. Price is $120 including shipping. Both ducts have a missing tab but can still be secured easily. They don't have grills in them and will need to be repainted as the previous owner painted them black. I found a complete bumper and no longer need these. I was gonna keep as a spare set but willing to sell. These are getting harder to find and ridiculously expensive. Cannot upload pics at this time but will email or txt you a pic if interested. Hello there. Over the next few months. I will be taking on the prosess of converting my new truck that I have just imported into New Zealand to right hand drive. I started tonight on pulling the dash and other interior parts out. And also removed. The steering box to be sent away to be all changed and returned as a right hand drive steering box. I will be posting pictures along the way as I get time. 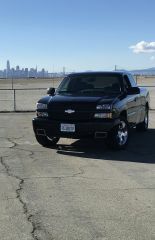 I am moving up to San Francisco in two weeks and can't take my truck with me. It's a 2003 AWD SS Silverado with 113k miles. I purchased it from a friend about 4 years ago with 80k miles. It has a salvage title from theft, I have the carfax and supporting docs. This has been such a great truck for me and I can't thank this forum enough for helping me with everything SS related. Upgrades include: 06 HD Hood and Grille, black 24 inch wheels, HID lights, Sound/navigation/backup camera, flowmaster exhaust. I haven't done anything to the engine, suspension, or drivetrain. I've really just used it as a clean truck to get to and from school/work. I am asking $11k but am open to reasonable offers. I would be happy to answer any questions or concerns, my cell is (818) 631-4870. If anyone has a brother, friend cousin, looking for a SS keep me in mind as well. Thanks. As stated in the title I'm in need for the 2003 black Silverado SS paint code. I know I can look in the glove and find it, but it's at home right now and I'm out of town, but I'm wanting to order the paint now so it can go ahead and be ordered. I thought a Onyx Black was used, but every paint site I go to to look up the code of my truck just calls it "Black" and gives the code WA8555. I'm just trying to make sure I don't screw up and order the wrong paint. Thanks in advance guys! Well earlier today a horse trailer in town took out my front bumper and drove off ... I am very sad about the whole deal but I guess life happens. At the moment I have a street scene one but it has always bothered me that it is one piece instead of separate. I was looking into getting an OEM or maybe a perfect replica one, any suggestions? Also I know that the street scene one works as a bumper cover and bolts right onto the bumper, will the OEM one work the same? Thanks.